You are here: Home / Jyotish Gemstones and Talismans / Whopping 3+ carats Colombian Emerald set in Gold Mercury Talismanic Ring. 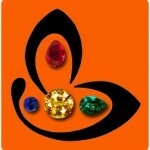 The exceptional clarity level makes it a top Jyotish Quality ring. 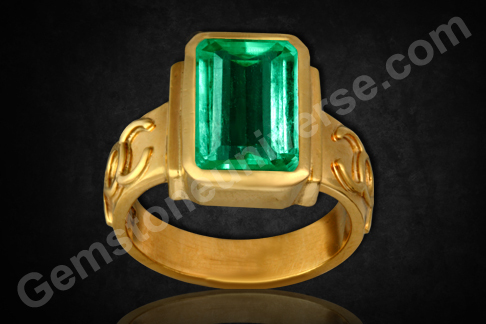 Whopping 3+ carats Colombian Emerald set in Gold Mercury Talismanic Ring. The exceptional clarity level makes it a top Jyotish Quality ring. Colombian Emerald of 3.16 carats set in Talismanic ring for Mercury Powers. Comments On view here is a stunning Mercury Talismanic ring. The centre gemstone is a Deep rich Colombian emerald with exceptional clarity. What makes it special that such kind of clarity is very rare in a 3+ carats Natural Emerald? The mercury symbols on the ring shanks accentuate the beauty. Clicking on the link below will take you to the video of this emerald ring.